On 30 May, RVO reported observations of Ritter Island following reports of a possible eruption and "sea surges" that destroyed homes on 19 May. On the S part of the island, scorched vegetation was observed and dead marine life (mainly reef fish) was seen around the coast line at heights of 4-6 m a.s.l. There was no evidence of fresh volcanic material, but a new landslide scar extended from the upper most part of the island down to sea level. Several more landslide scars were seen on the W wall. The estimated wave surge height resulting from the 19 May event reached 4-10 m, particularly around the S part of the island. Rockfalls continued to produce plumes that could be seen from a distance. According to the Rabaul Volcanological Observatory, a "small (probably submarine) eruption was reported to have taken place at Ritter Island on 18 April 2014 (figures 2 and 3). At about 1700 hours, an earthquake was felt at Kampalap village on Umboi Island. At the same time the level of sea rose a little over normal but was confined to the beach at Kampalap. At around 0000 hours on 19 April, another felt earthquake occurred. The earthquakes were estimated to have an intensity at Kampalap of between II to III. No floating debris where seen, and no ash or damage was reported." Figure 2. Location maps for Ritter Island. The upper map shows the region of Papua New Guinea containing Ritter Island and other volcanoes, and the lower map is enlargement of the center of the upper map focused on Ritter Island. From of Saunders and Kuduon (2009). Figure 3. Oblique aerial view of Ritter Island photographed in 2006 by John Holder (the originator of Oceanic Expeditions) from SW looking NE, with some of the location names used in the report by Saunders and Kuduon (2009). From of Saunders and Kuduon (2009). A Rabaul Volcanological Observatory (RVO) report by Saunder and Kuduon (2009) noted past possible geothermal activity on Ritter Island that had not been previously reported. According to their report, "In 1997 a patrol officer (Hita Mesere) in a media release relayed reports from Councilor Nalong (Kampalap Village?) of an explosive eruption and large waves reaching nearby villages. In the preparation of this report Mr. Mesere was contacted and he confirmed that he and officers from the Morobe PDO flew over Ritter after this event and saw white smoke coming from 'boiling' in the sea, close to land in the South Bay (Mesere, 2009 Pers. Comm.)." The report concluded that "Ritter is active, both volcanically and geomorphologically. More volcanic activity can be expected. Seismically this will probably not be as intense as in the early 1970's, as the conduit seems now to be open. Volcanic phenomena may however increase in importance if the cone continues to grow towards the surface and magma is erupted into an environment of lower hydrostatic pressures. There seems to be two causes of eruptive activity, one is the rise of fresh magma at the site of the submarine cone and the other is slope instability causing water to come into contact with residual hot rocks leading to small hydrovolcanian events close inshore of Ritter." The RVO report also included the following table (table 1) showing past observations of possible geothermal activity on Ritter Island. Table 1. Dates and details of reported post-collapse activity at Ritter. From of Saunders and Kuduon (2009). (Pilot report only) None reported N Y N N ? Tsunami of 1888. Several recent papers have revisited the 13 March 1888 collapse of Ritter Island volcano that generated a catastrophic tsunami. According to Ward and Day (2003), "In the early morning of 1888 March 13, roughly 5 km3 of Ritter Island Volcano fell violently into the sea northeast of New Guinea. This event, the largest lateral collapse of an island volcano to be recorded in historical time, flung devastating tsunami tens of meters high on to adjacent shores. Several hundred kilometers away, observers on New Guinea chronicled 3 min period waves up to 8 m high, that lasted for as long as 3 h. These accounts represent the best available first-hand information on tsunami generated by a major volcano lateral collapse." Eyewitness accounts noted the lack of explosive activity accompanying the collapse. In this paper, the authors simulated the Ritter Island landslide as constrained by a 1985 sonar survey of its debris field and compare predicted tsunami with historical observations. Ray and others (2014) reported that, based on primary and secondary eyewitness accounts on the morning of 13 March 1888, "there is no clear evidence for a coincident [to the collapse] or causal magmatic explosive eruption. One report suggests that there was activity (perhaps phreatic or phreatomagmatic explosions?) prior to the collapse that lead some of the resident local communities to seek higher ground, but evidence for precursory flank movements or changes in eruptive style have not been found in the historical accounts." References. Ray, M.J., Day, S., and Downes, H., 2014, The growth of Ritter Island volcano, Papua New Guinea, and the lateral collapse landslide and tsunami of 1888: new insights from eyewitness accounts, EGU General Assembly 2014, Geophysical Research Abstracts, v. 16, EGU2014-1305. Saunders, S., and Kuduon, J., 2009, The June 2009 Investigation Of Ritter Volcano, With A Brief Discussion On Its Current Nature, Rabaul Volcanological Observatory Open File Report OFP 003/2009, 25 pp. Ward, S.N., and Day, S. 2003. Ritter Island—lateral collapse and the tsunami of 1888. Geophysics Journal International, v. 154, pp. 891-902. Information Contacts: Rabaul Volcanological Observatory, P.O. Box 386, Rabaul, Papua New Guinea. According to a news article, "sea surges" destroyed four homes and a boat following an eruption of Ritter Island on 19 May. About 1,500-2,000 people on Siassi Island moved to higher ground. Villagers reported seeing plumes from the island, hearing rumbling noises, and feeling earthquakes. The article also mentioned that RVO and the Geophysical Observatory in Port Moresby did not record any seismic activity from the eruption. On 17 October, a villager from Kampalap (on the E coast of Siassi Island) reported unusual activity from Ritter Island to the RVO. The activity consisted of small felt earthquakes followed by emissions of white vapor and diffuse ash clouds. Rocks slid down the inner crater wall. Ashfall, which the observer indicated was not from Langila, was reported in Kampalap. Qantas Airlines reported to the Darwin VAAC that an ash cloud to about ~3 km a.s.l. was observed on 2 August at 1450. Analysis of satellite data did not show ash. Stations of the Papua New Guinea seismograph networks and high-gain central Australian stations recorded a swarm of unusual earthquakes on 8 October during the period 1930 to 2130 UTC. The magnitude (ML) of the shocks did not exceed 4.3 and there were at least 15 events with magnitude roughly 4.0. During the period 1945-2048 the seismic events were so numerous that there effects could not be distinguished. However near the start and finish of the swarm it was possible to recognize several separate events on PMG, LAT, WAB, and TLS seismograms, and arrival times of the seismic phases from those events indicated that the source of the shock was in the immediate proximity of the Ritter Island volcano. The effects of events recorded on seismograms were unlike those from tectonic shocks because of the long duration of the seismic waves and their long-period content. The Ritter Island area was inspected by A. Davies of the Rabaul Volcanological Observatory, who found that during the period of seismic activity submarine eruptions or explosions were observed close to Ritter Island. The vibrations from explosions caused landslides on Ritter Island and were felt with intensities of up to MM 4 at about 10 km from Ritter Island. The macroseismic data and the fact that there were relatively long-period waves in the seismic wave trains indicated a shallow source for the seismic waves, i.e. they were probably a direct result of some type of submarine explosion or caldera collapse. Information Contacts: I.B. Everingham, Port Moresby Geophysical Observatory, Port Moresby, Papua New Guinea. "A submarine eruption occurred at Ritter Island on 8 October 1972. Ritter is about 1.7 km long and 120 m high and is the eastern remnant of a volcano, which prior to a catastrophic eruption in 1888, was a cone some 800 m high. The 1888 event caused removal of most of the sub-aerial portion of the volcanic pile, probably by cauldron collapse, and an associated [tsunami] produced considerable loss of life on neighboring coastlines. Ritter has not been known to be active since 1888, and no thermal areas exist on the island, which is uninhabited. Observed activity on 8 October 1972 lasted from about 1930 to after 2130 UTC, witnessed by residents on neighboring Umboi and Sakar Islands. The site of the activity was submarine, just off the west side of Ritter. Explosive ejections occurred at the rate of one or two per minute, forming black, convolute eruption clouds. Rumbling noises were heard at a distance of 35 km. White vapor continued to rise from the eruption site for two days. Accompanying the eruptive activity was a strong seismic disturbance. Numerous tremors were felt at neighboring islands during the disturbance, with maximum intensities of MM 4-5 reported at a distance of eight miles from Ritter. A PNG Geological Survey, volcanological party inspected Ritter on 26 and 27 October. No evidence was found for sub-aerial activity, but numerous small landslides were observed, probably caused by ground movement associated with the seismic activity. An unconfirmed report suggests that vapor emission was seen at Ritter toward the end of November, but no further explosive activity has been observed." Information Contacts: R.A. Davies, Central Volcanological Observatory, Rabaul, Papua New Guinea. Ritter erupted briefly 17 October. The sequence of events was very similar to the October 1972 eruption. An almost continuous series of seismic events was felt on neighboring islands and recorded throughout Papua New Guinea from 0600 to 0650 local time. The eruption and small tsunamis were observed from islands west of Ritter. Minor land-sliding occurred on Ritter Island itself. The island was under observation by a volcanologist from 18 to 21 October, but there were no signs of eruptive activity and no visible traces of recent activity except landslides. Information Contacts: R. Cooke, Volcanological Observatory, Rabaul, Papua New Guinea. Submarine eruptions occurred at Ritter Island in 1972 and 1974 (CSLP Card 1973). More recently, small eruptions were reported during 2002 and 2006. The island, which sits off the W end of New Britain Island (figure 1), is composed of a ~ 1.9-km-long arc-shaped segment of the caldera rim. The inner, concave side of the island faces W. In clear weather villagers in Kampalap village, ~ 13.5 km SSW on Umboi Island, can see and monitor Ritter Island. Figure 1. Location sketch maps showing the context of Ritter Island, which sits just E of New Britain Island and N of the main island. Many of the islands shown contain Holocene volcanoes along the same arc as New Britain Island. Courtesy of VolcanoWorld. On 2 August 2002, an advisory was issued by the Darwin VAAC based on a pilot observation indicating an ash cloud to ~ 3 km altitude, although satellite data was unable to confirm the presence of ash. In what began as an ambiguous case, the Darwin VAAC issued an advisory for a 17 October 2006 eruption at Ritter Island. The initial report was confusing because a pilot had reported the eruption to the Rabaul Volcano Observatory (RVO) as being from Langila. The VAAC report noted that there was no plume at Langila in satellite imagery, but instead could see one farther W at Ritter Island. The plume was low and seen on MTSAT imagery (at 0133 UTC on 17 October); the presence of ash was not mentioned. A report to RVO from Kampalap village, passed through the Langila observer, confirmed unusual activity on 17 October. RVO reported occasional small earthquakes followed by white vapor and diffuse ash clouds. The Kampalap observer saw occasional rock slides from the inner crater wall. Fine ash fell at Kampalap that the reporter indicated was not from Langila. No similar eruptive episodes were recorded through 1 November. Throughout this interval the RVO relied on seismic instrumentation in West New Britain, but an instrument was being prepared for possible deployment at Ritter Island. Information Contacts: Herman Patia, Rabaul Volcanological Observatory (RVO), Department of Mining, Private Mail Bag, Port Moresby Post Office, National Capitol District, Papua New Guinea; VolcanoWorld (URL: http://volcano.oregonstate.edu/). On 17 October 2006 occasional small earthquakes on Ritter Island were followed by emissions of white vapor and diffuse ash clouds, occasional rock slides from the inner crater wall, and ashfall on nearby Umboi (Siassi) Island (BGVN 32:03). No further activity was reported until 19 May 2007, when sea surges destroyed a boat and four houses on Umboi following an eruption, according to media quotes from Morobe Province disaster and emergency director Roy Kamen. Kamen also noted that 1,500-2,000 people from two villages had moved to higher ground for fear of tsunamis. As of 21 May residents could still hear rumbling noises, see "smoke" rising from Ritter Island, and feel tremors. The Rabaul Volcanological Observatory (RVO) and the Geophysical Observatory in Port Moresby did not record seismic activity from the eruption on their equipment. Reports received by RVO from Jonathan Kuduon at Kilenge (western New Britain) on 30 May indicated evidence of high waves (4-10 m high) around Ritter Island, with a maximum of 10 m on the S part of the island. Scorched vegetation was seen in the same area, and dead marine animals, mainly reef fish, were seen around the coastline. There was no evidence of fresh volcanic material, but a new landslide scar was visible on the S tip of island, an area that extended from the uppermost part of the island (~100 m elevation) down to sea level. Several other small landslide scars were seen on the W wall. Rockfalls continued to produce clouds that could be seen from a distance. Seismic activity was low during one day of recording on 27-28 May; only four high-frequency earthquakes were recorded. RVO noted that the event on 19 May was similar to the 1972 and 1974 events, in that they lasted only a few hours and were preceded by explosion noises followed by disturbance of the sea. Both the 1972 and 1974 activities occurred offshore, and landslides were triggered during the 1974 activity. The 19 May event may have been due submarine explosions or earthquakes associated with volcanic activity that triggered the landslide(s). Information Contacts: Herman Patia, Rabaul Volcanological Observatory (RVO), Department of Mining, Private Mail Bag, Port Moresby Post Office, National Capitol District, Papua New Guinea; Australian Associated Press, AAP News Centre, 3 Rider Boulevard, Rhodes Waterside, Rhodes, NSW 2138, Australia (URL: http://aap.com.au/). Prior to 1888, Ritter Island was a steep-sided, nearly circular island about 780 m high between Umboi and Sakar Islands. Several historical explosive eruptions had been recorded prior to 1888, when large-scale slope failure destroyed the summit of the conical basaltic-andesitic volcano, leaving the arcuate 140-m-high island with a steep west-facing scarp. Devastating tsunamis were produced by the collapse and swept the coast of Papua New Guinea and offshore islands. Two minor post-collapse explosive eruptions, during 1972 and 1974, occurred offshore within the largely submarine 3.5 x 4.5 km breached depression formed by the collapse. Blong R, 2016. Joining the dots: William Dampier the navigator, the 17th century eruption of Ritter Island, the conception of Jesus Christ, minor errors in the Smithsonian Catalogue of Volcanic Eruptions, and the United Kingdom tax year.. Risk Frontiers Newsletter, v. 16, no. 1. Cooke R J S, 1981. Eruptive history of the volcano at Ritter Island. Geol Surv Papua New Guinea Mem, 10: 115-124. There is no Deformation History data available for Ritter Island. There is no Emissions History data available for Ritter Island. This arcuate, 1.9-km-long, 200-m-wide remnant is what remains of Ritter Island after its catastrophic collapse in 1888. Prior to 1888, Ritter Island was a steep-sided nearly circular island about 780-m high. 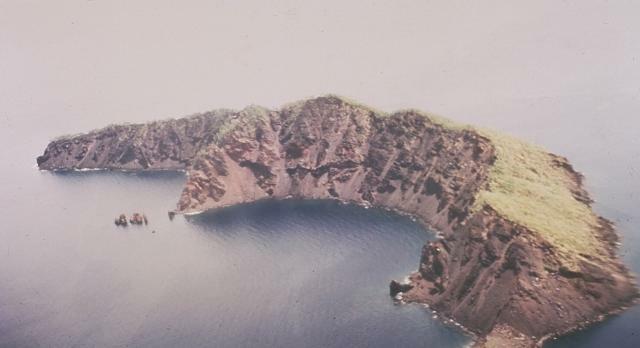 Large-scale slope failure destroyed the summit of the conical volcano, leaving an arcuate 140-m-high island remnant with a steep west-facing scarp, seen here from the SW. Two minor post-collapse explosive eruptions, during 1972 and 1974, occurred offshore within the largely submarine 3.5 x 4.5 km breached depression formed by the collapse. There are no samples for Ritter Island in the Smithsonian's NMNH Department of Mineral Sciences Rock and Ore collection. Large Eruptions of Ritter Island Information about large Quaternary eruptions (VEI >= 4) is cataloged in the Large Magnitude Explosive Volcanic Eruptions (LaMEVE) database of the Volcano Global Risk Identification and Analysis Project (VOGRIPA).